While I was scouting for Michael Le-May’s astounding photo of a Green Woodpecker trying to shake off a weasel mid-flight when I had woodpeckers on the brain, I spotted this amazing footage of another weasel bird encounter. These tiny predators, smaller than stoats are the smallest of the European carnivores, indulge me if you will as I have a fancy to approach this # in the style of Johnny Morris, a childhood hero. 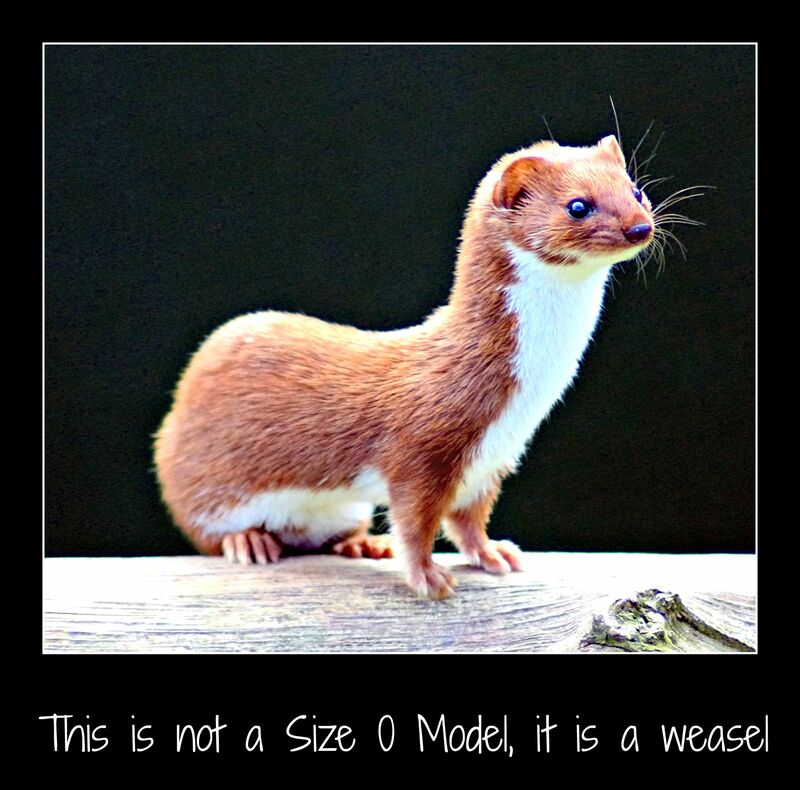 Weasels are (in my slightly warped mind at least) the animal equivalent of the human animal Size Zero models : they are sleek, long, & in good condition very glossy, they too have a high surface area to body weight ratio and thin layer of body fat, and get cold really quickly. Unlike said models, however, who I doubt eat very little, if anything at all and I certainly can’t imagine for a moment spend their days rushing about jumping & climbing as they hunt for prey (at least of the edible variety!). Their staple diet is small & squeaky – shrews, voles & mice, however, if they are skilled & hungry enough they will tackle eggs, small birds (including the odd Green Woodpecker) & rabbit kittens as well. (I’m back on weasels now in case you are worried about Size Zero models dietary habits! Weasels live in burrows, too busy hunting & eating to make their own, they tend to be the former residence of mice or voles. I don’t know what the exact arrangements are, but I doubt very much that Estate Agents & contract exchanges are involved. I suspect that the reasons for property becoming vacant, maybe more chilling & probably down to the weasel… Having acquired their chosen property they do take time to furnish it with hay & moss in preparation for the patter of tiny feet. Mr & Mrs Weasel will have single litter of “kittens” of between 3 & 6 per year, so it’s as well for everyone involved that they grow up fast! Weaned by four or five weeks they are entirely independent at 3-4 months & may even start a family of their own in their first year of life. So it won’t come as a great surprise then to learn then, that despite the continuing persecution of the weasel by Game Keepers to protect game birds from being eaten by them; the Weasel population is a long way away from being on the concerned list let along the endangered one. The Native Americans who have a thankfully more balanced vies of nature in their vast store of stories about nature have several about weasels, this is one of my favourites. 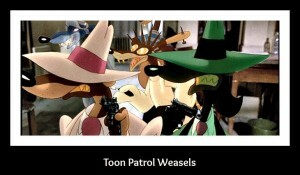 Weasels are identifiable by their brown coats and creamy white underbelly. If you spot a Weasel in the UK with a black tip to it’s tail, or if you happen to be in Scotland in winter with white coat (Ermine) then it isn’t a weasel, it’s a stoat. If you see a large group of white fur clad, sleek looking creatures surrounded by photographers in the wild, then it’s a photo shoot of Size Zero models; and if you happen to have a tin or two of red-paint on you, you know what has to be done…. Ever seen one of these tiny creatures?